Ouch!! Are you going to the doctor to see if it’s torn? All I can offer is my sympathy. Our driveway becomes an ice rink of doom around this time of year, too. That’s a cute hat! 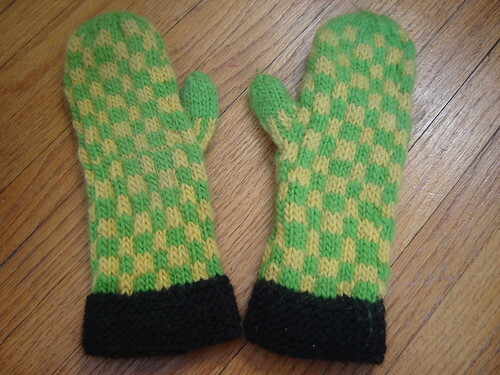 And the mittens too! So sorry about the hut leg; I hope you feel better soon. I consider myself lucky when I get out the door with my keys in my hand, my three-year-old, and my pants on. I can’t imagine how (poorly) I’d fare with your going-out-the-door juggling routine. So sorry to hear about your injury! OUCH! I really hope you’re back up to speed soon. Hope it heals up quick. Sorry to hear about your injury. I cannot imagine how much that hurt! I know what you mean about teaching and injury. It’s more work to be out than it is to just suffer through the teaching day. But, omigod, does it make for a long day and then you just end up not getting better. Here’s hoping you heal up quickly. 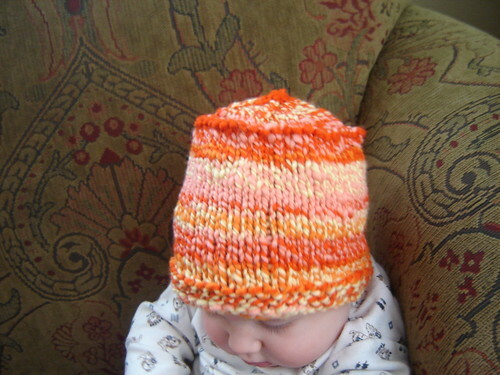 Cute hat on Spinner – but really? I just want to nuzzle those little baby cheeks! My SIL teaches cello and piano – are you strictly a music teacher? Sorry to hear your hurtin’ right now – how frustrating! (Add expletives at will.) Lotsa ibuprofen and rest is all I can think to recommend. Get better soon! Sorry to hear you injured yourself. I know when you are a teacher it is so much more work to catch up on when you have to stay home sick too! Love the hat and the mittens, but especially the hat. Yeouch! Falls (and the pain you find later) are the worst. Let us know when you are mobile again. Searched Yahoo/Bing and ended up here – its good so I psetod the site on my Facebook account !